I was contemplating whether or not to do a write up on this most recent visit. Primarily because I did a HORRIBLE job on the pictures this time (I missed a bunch), but also because I did not feel that this latest visit was representative of our normal meal quality here (in terms of variety). This latest visit was completely bogarted by one of our first dishes, such that we were barely able to have anything else. That said, our time at Kanoyama is always great. The staff there is super friendly, and super accommodating. Despite not having visited in a couple of months, they still remember us, our names, what we drink, what we like, all that goodness. It really makes you feel at home, and welcomed. Service is so underrated these days! Or better yet, NICETIES are so underrated. Just because you’re at a trendy new restaurant, or a super conservative long standing restaurant, whatever your situation, it does not mean you have to have a big stick up your rear, and a puss face permanently glued on! Sorry, I am big into being nice, and really, too many people are just pompous turds these days. Case in point, the patrons that sat immediately behind us. Two men in their early 50s, loud, rambunctious, placed an order for oysters right before us. Shortly after we placed our order, the third member of their party joined. They were super excited, attempted to get the attention of the waiter via a snap of the fingers (who does that??? ), screaming out for additional drinks. The waiter asked them hang on, as he was serving another table. At this point, the man proceeded to walked up to the sushi counter, to the staff member that was shucking the oysters, and doubled their order, requesting all the oysters to be served at the same time. Really? How about waiting two minutes for the waiter to return like a normal human being? And should every other patron at the restaurant just keep waiting until you are done with your second, third, fourth orders? How obnoxious! Ok, enough of that. 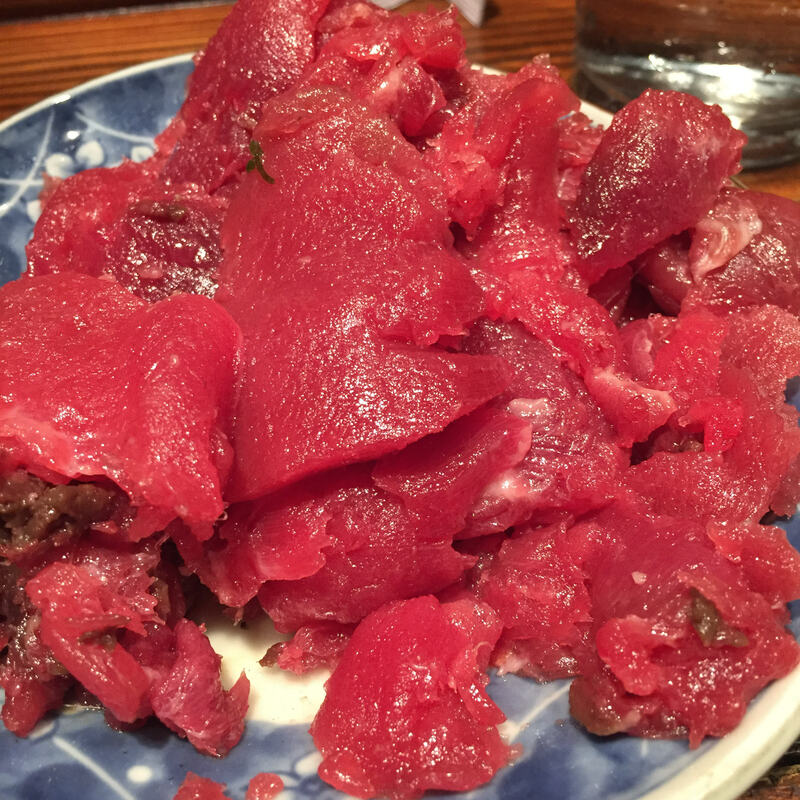 NAKAOCHI (Tuna Rib) Appetizer – I LOVE their NAKAOCHI, it’s always fresh, really delicious and just fun to eat! However, the cut can be really large, overtaking your entire meal. For this reason, I specifically asked for the absolute smallest cut that they had. What they served me was NOT small, it wasn’t even medium sized, it was GINORMOUS! 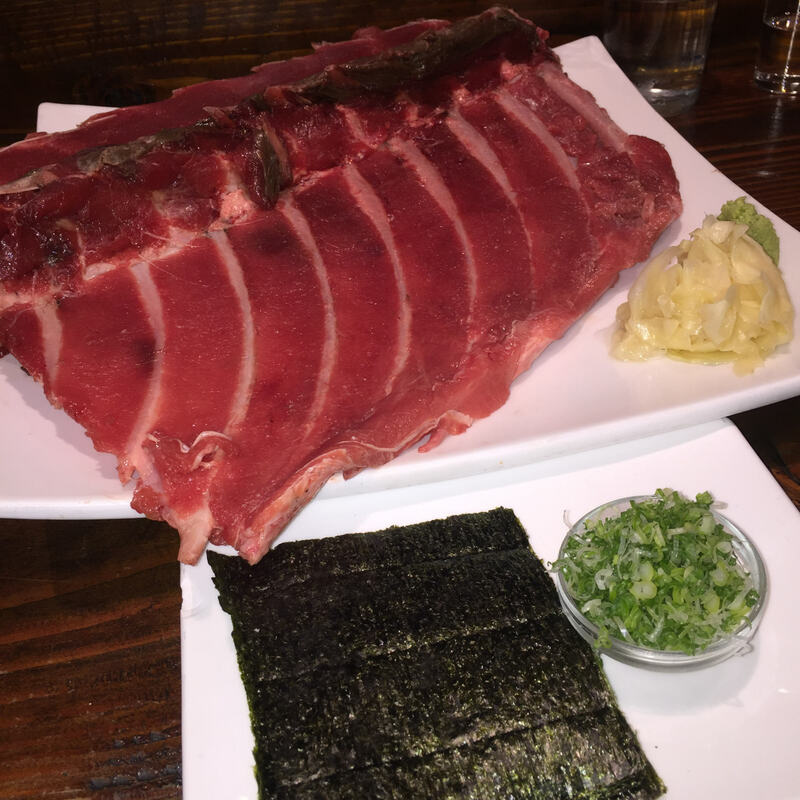 See this plate of Tuna rib? 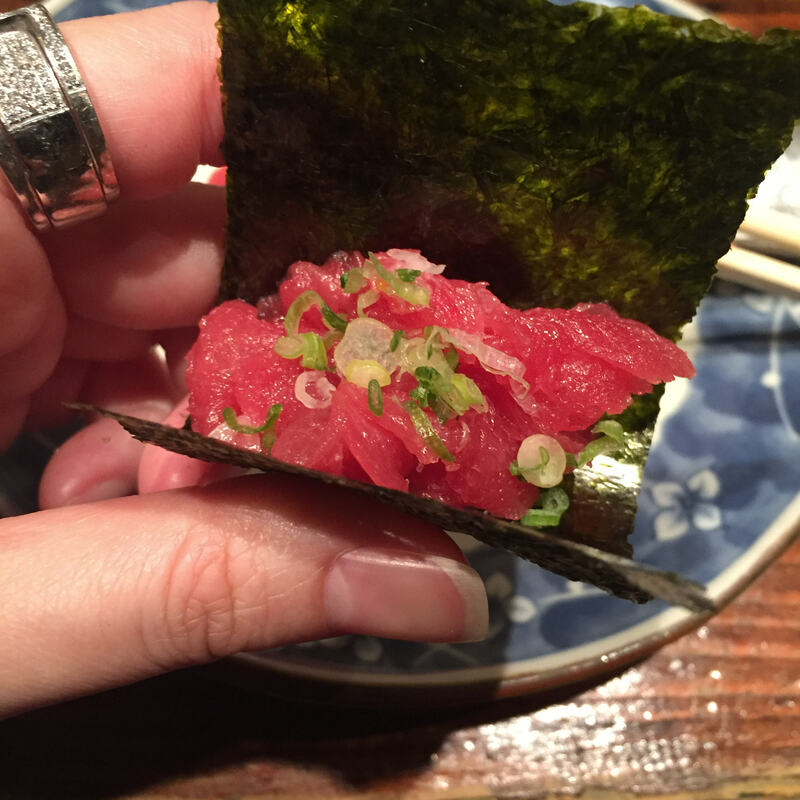 It’s actually the Tuna we had to scrape off so we can make room on the counter for our other servings. In a way, they were LEFTOVERS that we obviously will not be taking home. What a shame! 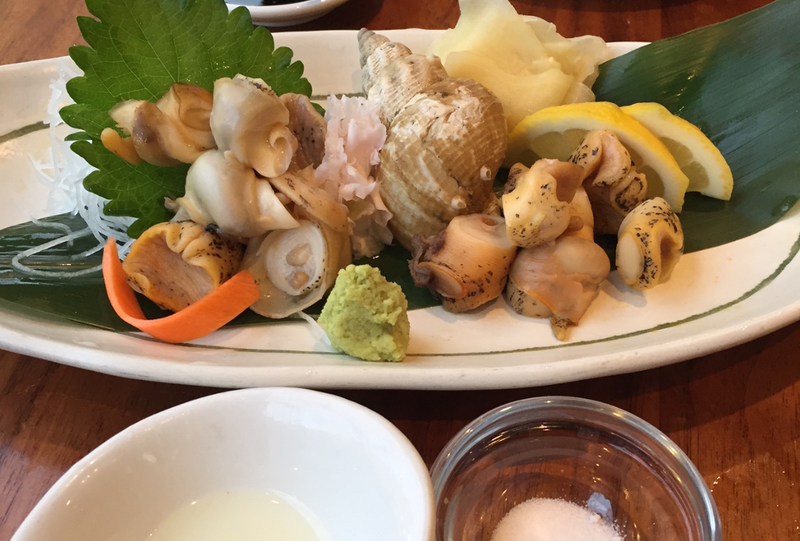 Baby Conch Appetizer – New Yorkers don’t embrace our single shell clams enough. WHY??? I LOVE single shell clams, the BAIGAIs (small Japanese snails), the TSUBUGAIs (whelks), The SAZAEs (turban shells), the generic “Conches”… But because there isn’t much of a fan base, sushi-yas just don’t stock them. They occasionally stock AWABI/TOKUBUSHIs (abalones), but that’s pretty much it. It’s so sad. 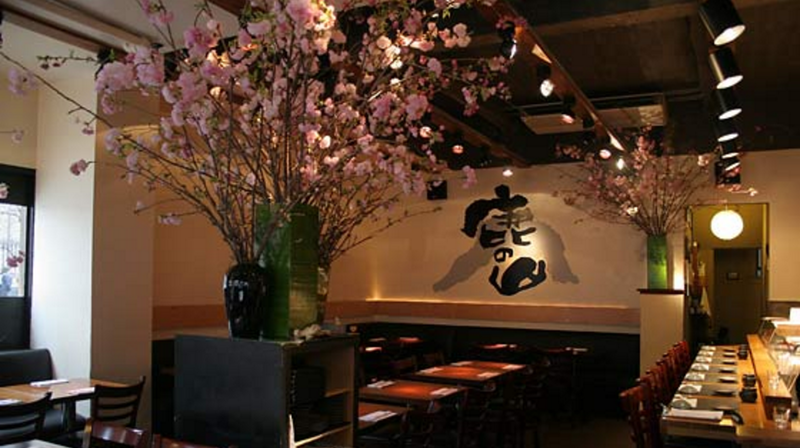 If I owned my own sushi-ya, I would do periodic “tastings” of various “hard to find” shells, and drum up a fan base. Kanoyama is the ONLY sushi-ya I know that consistently serve baby conch. When I have a craving… I know where to go! 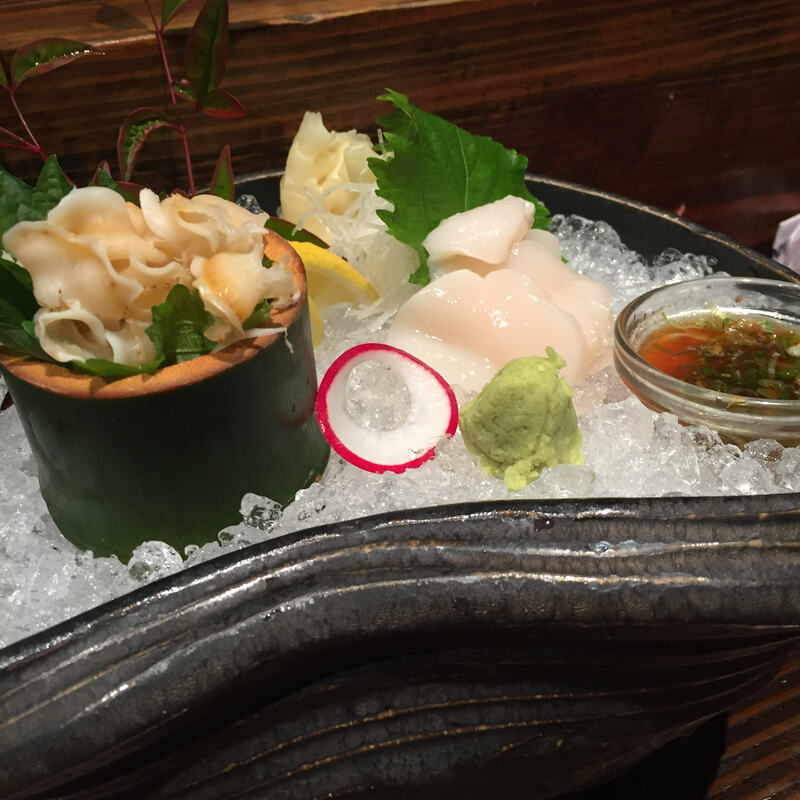 Live Hotate (Scallop) Appetizer – Always fantastic. Perfectly fresh and crisp slices of HOTATE, served with a ponzu dipping sauce. DELISH! 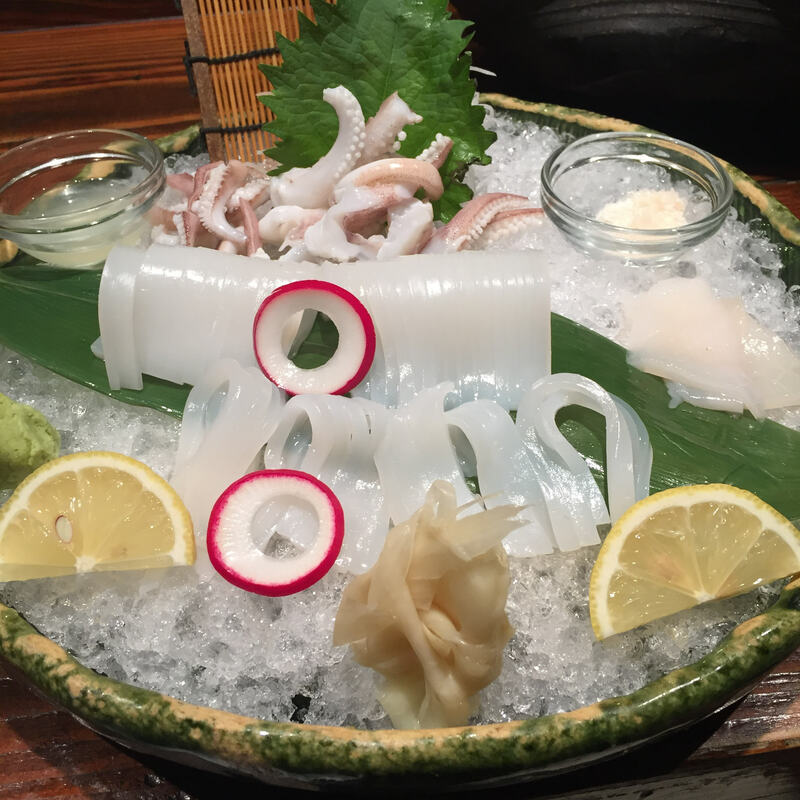 YARI IKA OTSUKURI (Squid) Appetizer – For YARI IKA, this was incredible. Super light, fresh, crunchy thin slices, served with lime mixed juice and sea salt. We actually ordered more food, but we were beyond stuffed. Darn that delicious but oversized NAKAOCHI!!! I had to ask the waitress to kill the remaining order. I don’t feel good about doing ratings based on so few dishes, so please refer to the May 2016 posting for that information.